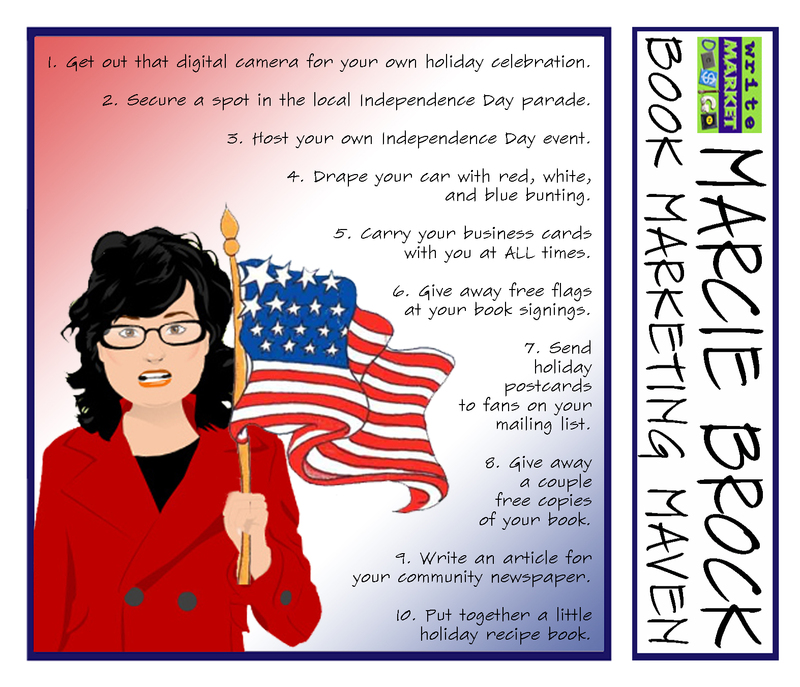 Grab your flag, sparklers, and bunting – July 4th book marketing ideas! Well, Independence Day falls on a Wednesday this year. That means you either get a gloriously long weekend – or you get an extra day off in the middle of the week. 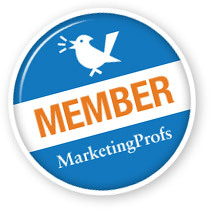 Either way, it’s a perfect opportunity to market your book, regardless of the topic! Freedom, history, and patriotism are just a few of the themes of this holiday. Your job is to find the natural tie-ins and leverage them as best you can. Remember, the ideas here are just suggestions. Your goal should be to try them out and see what works for YOU. Even better, though, would be to use this list as a jumping off point, getting really creative and coming up with your own unique book marketing strategies! Get out that digital camera for your own holiday celebration. Your readers want to CONNECT with you. You don’t have to take them on a detailed tour of your home or interview every relative at the family picnic … but giving them a glimpse of your life so they can feel closer to you will go a long way toward building rapport and a lifelong fan. Purchase or dust off your banner, head to the dollar store for an Uncle Sam hat, and get yourself a spot in your local Independence Day parade. If vendor booths are available, you may be the only author there! Host your own Independence Day event. Sponsor a pancake breakfast at a local restaurant or do a holiday book signing at the flag shop. Drape your car with red,white, and blue bunting and a big sign with your book cover and website on it. Don’t be afraid to BE memorable! Make sure to carry business cards and/or postcards with you at all times so that you can hand them out when you meet new people. Leave them behind at coffeehouses and shops that allow it. Give away free flags at your book signings. This tip doesn’t have to be limited to July 4th. Find flags for all the holidays – or that match the theme of your book. Put your website on them somewhere so they serve as ongoing reminders of how to find you. Use www.GotPrint.com to send holiday postcards to those on your list for whom you have mailing addresses. Use your blog or social media sites to give away a couple free copies of your book to celebrate the holiday. Throw in a couple 4th of July bookmarks with your website and contact info. The 4th of July is all about picnics and comfort food. Come up with a dozen of your favorite recipes (if they’re related to your book, all the better) and put together a little pamphlet or eBook to give away for free via your website, blog, or social media platforms. Write a media release about the recipe book giveaway. 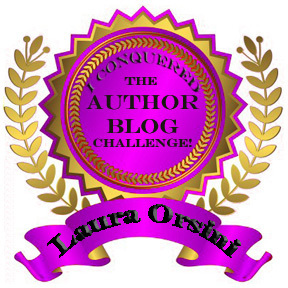 Guess who’s participating in an Ultimate Blog Challenge?!! 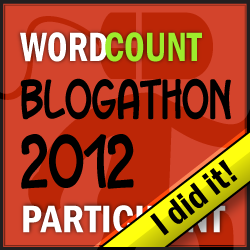 Funny thing about Ultimate Blog Challenges – there seem to be quite a few of them. I could say something snarky about the meaning of “ultimate” – but it’s a cool word, so who can blame multiple people for using it as the moniker for their blog challenges? The one we signed up for is created and hosted by Michele Scism, a business strategist best known as “The Results Lady,” and Michelle Shaeffer, a work-at-home mom who loves to share the tips and strategies she’s learned to help other home based business owners. The rules for this UBC are to post 30 times in April – not necessarily 30 days in a row, because you can do two posts in a day, as long as your total by April 30th is 30 posts. There’s an unspecific rule that says, “Each post must have text (so don’t just grab a video–you have to add your own pithy thoughts).” They do not indicate how much text qualifies as “having text.” All posts must be PG (not a problem for us), and each participant is encouraged to use their social networks to promote their posts and also those of other participants. We like to put our money where our mouths are. If we’d encourage you to do it, we feel we should act on our own advice. We encourage you to find a UBC and get going! While we don’t really need motivation to blog, we’re taking this for the kick in the pants it is to do something we’ve never done – post 30 days in a row, so we’re altering the rules for ourselves just a bit. We actually have to begin with yesterday’s post, since a frightful cold has left us 2 days behind already. And we will hit adhere to the UBC rules as well with 30 April posts – so look for a couple days of double-up in the future. We never pass up an opportunity for greater exposure! Each participant is featured on the UBC site, and all posts are shared with the UBC Facebook group. You should see the variety! We’re thinking about creating our own version of a UBC for Authors, so we thought we’d try one out first to see how we want to set ours up. There are lots of tips and advice for anyone still a little wobbly about getting their blog off the ground. Again, we don’t necessarily face challenges for topics, but when you sign up to take the UBC, you receive a daily e-mail with an idea for that day’s blog post. Share a story or a list of social media pet peeves. I know we’ve all got some. I personally hate when people use social media for personal arguments or feuds. No need to air out in social networks. Guess I’ll write a separate post on today’s theme to help kick in my 30 posts by the end of April! In the meantime, what are you waiting for? Find a UBC that works for you, sign up, and get posting! Then come tell us about your experience here.